Need help uploading files? Watch this video tutorial! 1. When adding a new version of an existing file, please edit the previous upload. 2. The maximum upload size is 100 MB. For larger files, please contact us or use the external link option. 3. You only need to specify a file size if you are linking to an external file. 4. Please don't overuse BBCode formatting and smilies in your file descriptions. Please also try to keep file descriptions to an acceptable length. 5. If you are not the author of a file, make sure you have permission to upload it. No stolen work! 6. All uploads must comply with the posted Forum rules. 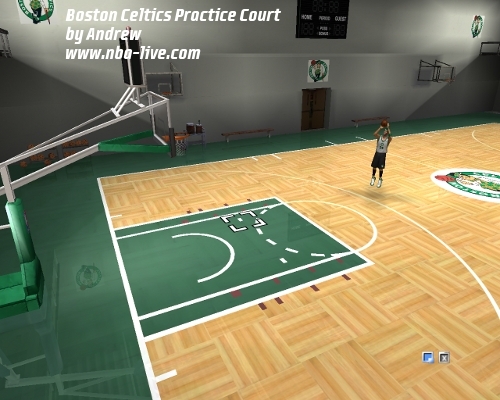 This patch replaces the default practice court in NBA Live 08 with a Boston Celtics practice court based on the one at their training facility.